The only poor news reported this week was in the rear-view mirror, where the final revision showed 3Q GDP to be even weaker than previously thought at +1.8%. Monthly data was strong, as housing permits and starts were the strongest in 3 years leaving aside the month when the $8000 housing credit expired. Consumer sentiment rebounded further and has now made up nearly all of its debt debacle induced slide. 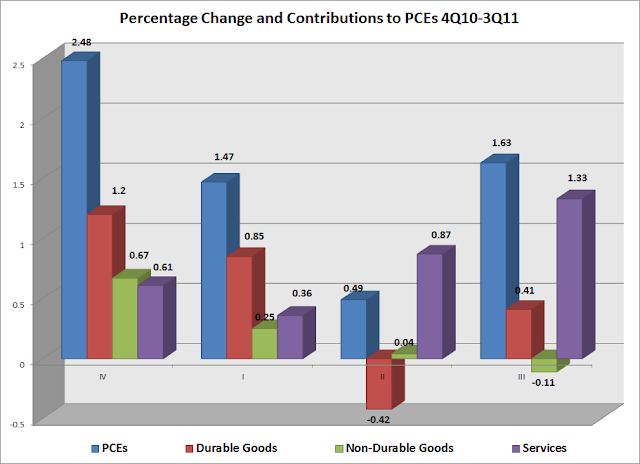 Durable goods also came in stronger than expected. Existing home sales improved from the month before. New home sales improved as per expectations. Personal income and saving were up slightly. The LEI were reported up +.5. This week, the high frequency weekly indicators lit an afterburner for a closing kick to the year, as they were all either strongly positive or at least neutral. 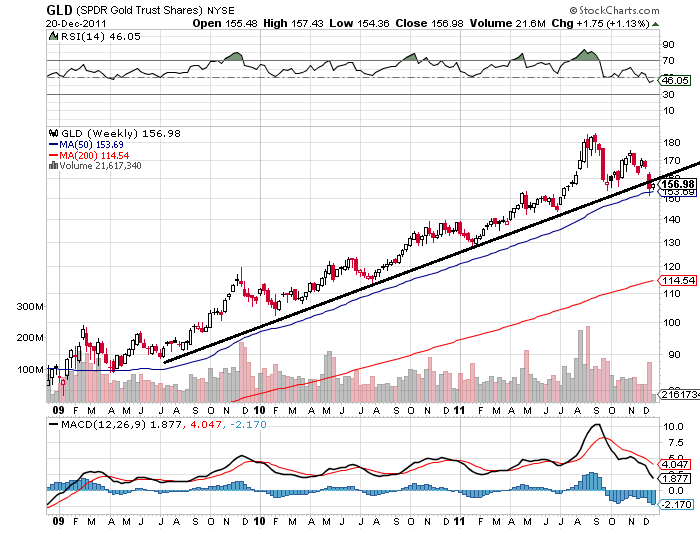 They are at the point where holiday seasonality strongly affects their week over week performance. I again remind new readers that my "Weekly Indicators" column is not designed to be a big picture forecast of the future, but rather by use of high frequency data to capture an up-to-the-minute snapshot of the economy as it is right now. Perhaps the strongest kick came from rail traffic, which has been on the rebound for months. This week it delivered the best comparison in years. The American Association of Railroads reported that total carloads increased 9.2% YoY, up about 45,300 carloads YoY to 538,000. Intermodal traffic (a proxy for imports and exports) was up 13,200 carloads, or 6.0% YoY. The remaining baseline plus cyclical traffic increased 31,800 carloads or 11.7% YoY. Turning to jobs, adjusting +1.07% due to the 2011 tax compromise, the Daily Treasury Statement showed that withholding for the first 15 days of December stood at $114.4 B vs. $109.9 B a year ago for a gain of 4.5 B. For the last 20 reporting days, $148.1 B was collected vs. $139.1 B a year ago, a gain of $9.0 B or +6.5%. This is a marked and welcome contrast with last week's YoY -1.1% loss. The BLS reported that Initial jobless claims declined by 2,000 to 364,000. This is the lowest figure in over 3 1/2 years. The four week average declined by 7500 to 380,250. Take both of these with grains of salt since this is the third week where year-end seasonality is significant. Even if the numbers are slightly overcompensating for seasonal factors,however, the trend is excellent. The American Staffing Association Index remained at 92 last week. This series will plummet in the next couple of weeks due entirely to seasonality. It is still slightly below last year's levels, after stagnating earlier this year. Turning next to housing, for the fourth week in a row, YoY weekly median asking house prices from 54 metropolitan areas at Housing Tracker were positive, up +1.3% YoY. The areas with YoY% increases in price remained at 25, just two short of 1/2 of all areas. The number of areas with greater than 10% YoY declines increased by 1 to 2 due to an apparent glitch in the December 2010 data for New Orleans. The Mortgage Bankers' Association reported that seasonally adjusted purchase mortgage applications decreased -6.9% last week, continuing its decline from one week before. On a YoY basis, purchase applications were down -4.9%. The actual reading remains firmly within the range that purchase mortgage applications have been in since May 2010. Refinancing fell -6.9% w/w. Retail same store sales were tepid to good. The ICSC reported that same store sales for the week ending December 17 increased a strong 4.6% YoY, and were also up 3.4% week over week. Shoppertrak reported that YoY sales increased 1.3% YoY and reversed last week's big decline, with a 21.7% gain. Johnson and Redbook reported a 3.4% YoY gain. Weekly BAA commercial bond rates decreased .10% to 5.20%. Yields on 10 year treasury bonds also fell .10% 1.94%. For the last month before this week, spreads widened again, representing increasing weakness. 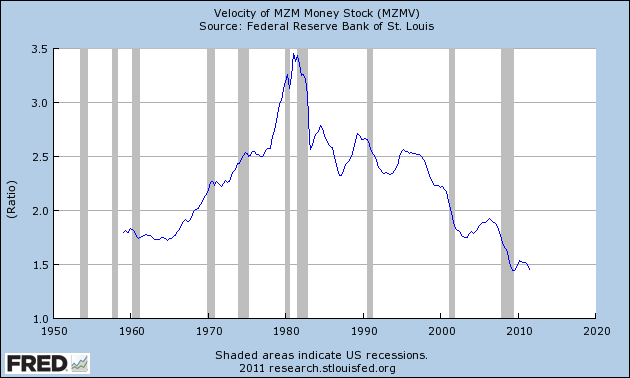 Money supply has been generally flat since its Euro crisis induced tsunami of several months ago. M1 decreased -0.1% last week, and was unchanged month over month. It is now up 17.7% YoY, so Real M1 remains up 14.3%. This is about 7% under its peak YoY gain several months ago. M2 was up +0.3% w/w but also unchanged month over month. It remains up 9.7% YoY, so Real M2 was up 6.3%. This is also significantly less than its YoY reading at the crest of the tsunami. Oil closed at $99.24 a barrel on Thursday. This slightly above the recession-trigger level calculated by analyst Steve Kopits. Gas at the pump fell $.06 a gallon to $3.23. Measured this way, we are just about at the 2008 recession trigger level. Gasoline usage, at 8879 M gallons vs. 9213 M a year ago, was off -3.6%. The 4 week moving average is off -4.7%. Since March the YoY comparisons have been almost uniformly negative, and substantially so since July. This week's data put a turbocharger on Santa's sleigh, with several reports giving the best reading in over 3 years, and others at least moving forward slowly but smoothly. Even Oil, while always a concern, left a little extra change in consumers' pockets compared with the last 11 months. Have a Merry Christmas or at least a nice long weekend! I hope you'll forgive me for tooting this blog's horn a little bit. While we have many readers who followed us over from the progressive blogosphere, we also have many new readers from places like Seeking Alpha, Business Insider, and Abnormal Returns. On August 8 of this year, the S&P 500 closed at 1119.46. 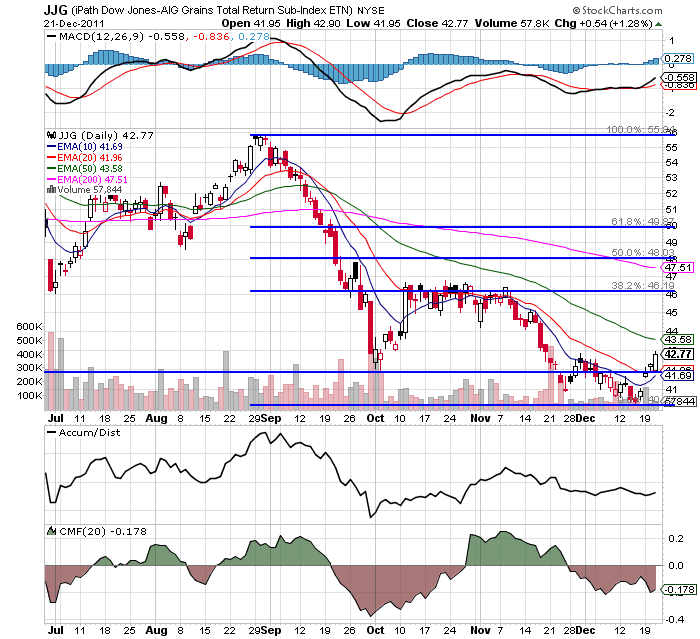 The next day it set an intraday low of 1101.54. 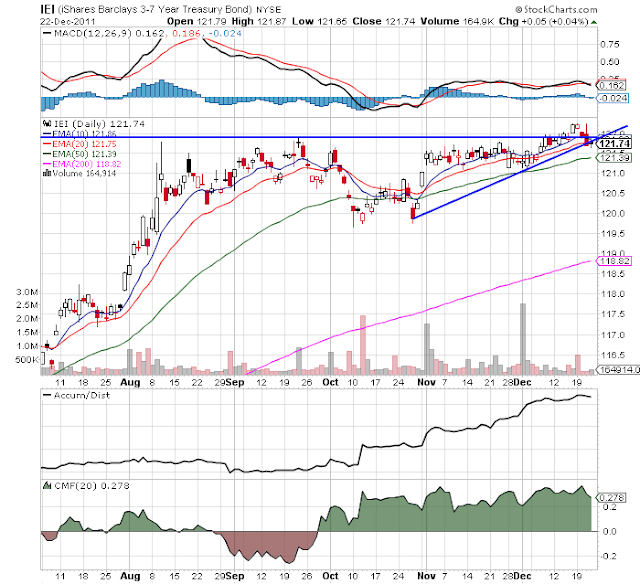 Then on August 10 it closed at 1120.76. 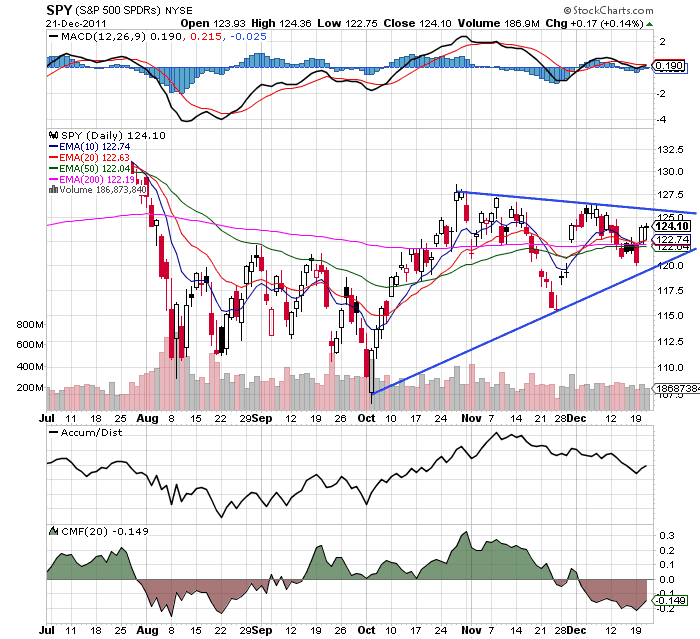 On August 12 Bonddad wrote that It looks like SPY's are forming a rounding bottom. 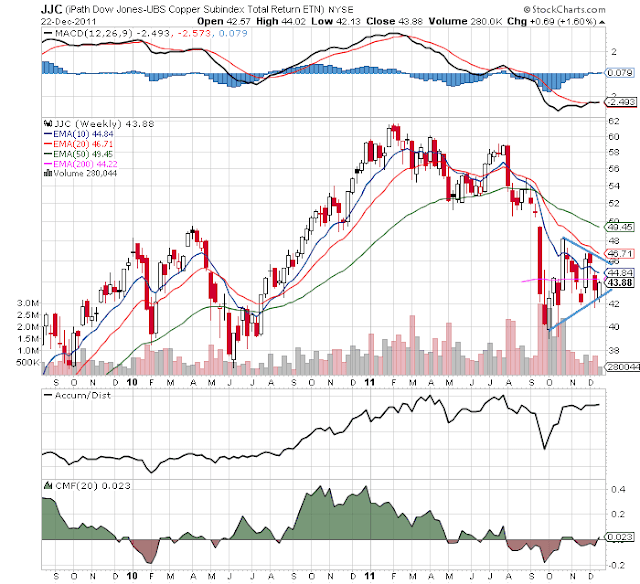 On the morning of the 10th immediately after the intraday low, based on investor sentiment and several Doomer contrary indicators, I had written, BREAKING: THE BOTTOM IS IN!!!. Before you think of stopped clocks and such, this is the second year in a row in which this blog has called the yearly bottom in real time. On July 6, 2010, I wrote that market sentiment is a big, fat, hanging fastball and said it looked like we were close to a bottom. And sure enough, the intraday low of all of 2010 was the day before. There are plenty of other contrarian but correct calls Bonddad and I have made over the last 5 years. Those of who who've known us all along, thanks for continuing to read us, and Welcome! to all of you newcomers. Weekly Indicators will be posted tomorrow as usual. Aside from that, I'm taking a break for a few days, but hope to post year end wrap-ups on housing, oil, deleveraging, and a personal reminiscence. Merry Christmas or Happy Holidays, whichever you prefer! Let's continue looking at the last 12 months to see where the economy is growing -- and where it's not. 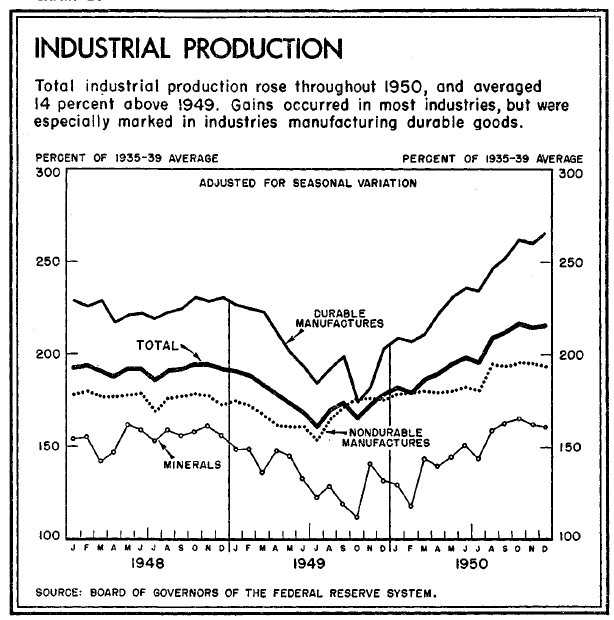 Overall industrial production is rising. It rose in January of this year, moved sideways through the Spring, and then moved higher again 5 months ago. 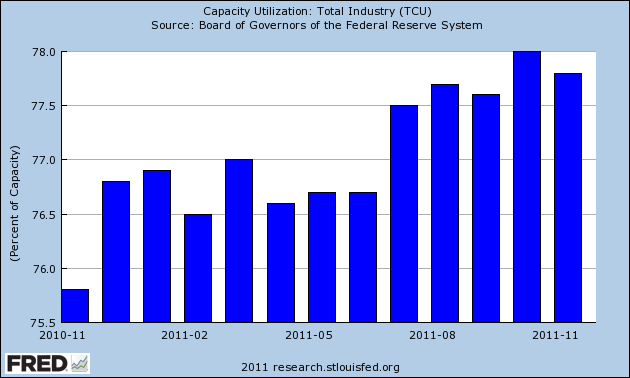 We see the exact same pattern with capacity utilization. 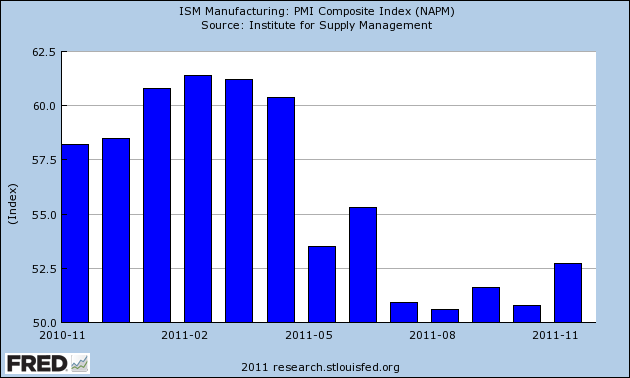 The ISM number dropped sharply in May of this year and has been hovering just above 50 for the remainder of the year. However, the overall number is still positive. The employment number is still low, but also still in positive territory. 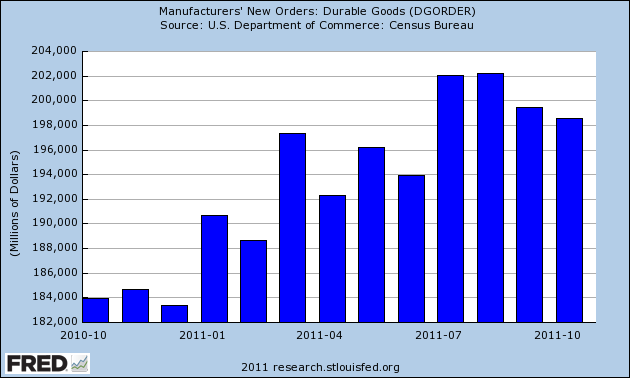 Finally, the overall trend for durable goods new orders is higher; however, it's been a bumpy ride. Orders peaked four months ago and have been drifting sideways since. I covered the latest two Empire State and Philly Fed manufacturing indexes here. Both showed an overall increase, although both are still at levels just over expansion. In November, the seasonally adjusted composite index of manufacturing activity — our broadest measure of manufacturing — increased six points to 0 from October's reading of −6. Among the index's components, shipments gained seven points to 1, while new orders edged up three points to finish at −2 and the jobs index steadied, moving up seven points to 0. Most other indicators also suggested modest improvement. The index for backlogs of orders rose five points to finish at −10, while the capacity utilization indicator edged down two points to −6. Additionally, the delivery times index increased three points to end at 5, while our gauges for inventories were slightly lower in November. The finished goods inventories index fell five points to 18 and the raw materials inventory index lost ten points to end at 15. Texas factory activity decreased in November, according to business executives responding to the Texas Manufacturing Outlook Survey. The production index, a key measure of state manufacturing conditions, dipped from 4.1 to –5.1, registering its first negative reading in two years. 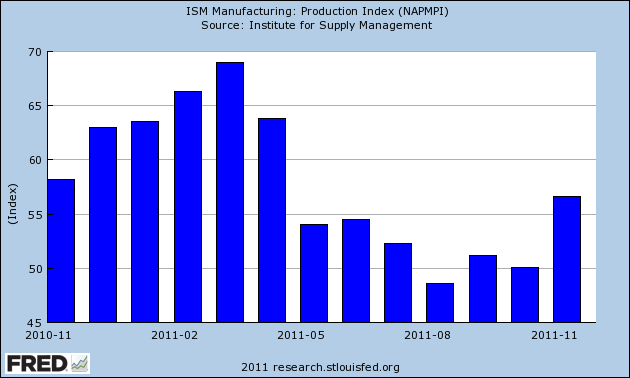 Other measures of current manufacturing conditions also indicated contraction in November. The new orders index suggested deterioration of demand, falling to –5.1 after a year in positive territory. Eighteen percent of manufacturers noted increased order volumes in November, compared with 23 percent noting a decrease. The shipments index edged down from 2.7 to –1.1, suggesting the volume of shipments fell slightly. The capacity utilization index tumbled to –10.2 after several months of weak readings centered around zero. activity slowed in nondurable goods factories, while growth increased in durable goods producing plants, particularly for aerospace and fabricated metal products. Most other month-over-month indexes also eased somewhat in November. The production and shipments indexes decreased to 0, and the new orders and order backlog indexes were negative. The employment index dropped to its lowest level of the year but remained slightly positive, and the new orders for exports index moderated slightly. Raw materials inventories continued to grow moderately, while the finished goods inventory index moved sharply higher. The Chicago Fed Midwest Manufacturing Index (CFMMI) increased 0.7% in October, to a seasonally adjusted level of 85.5 (2007 = 100). Revised data show the index increased 0.2% in September. 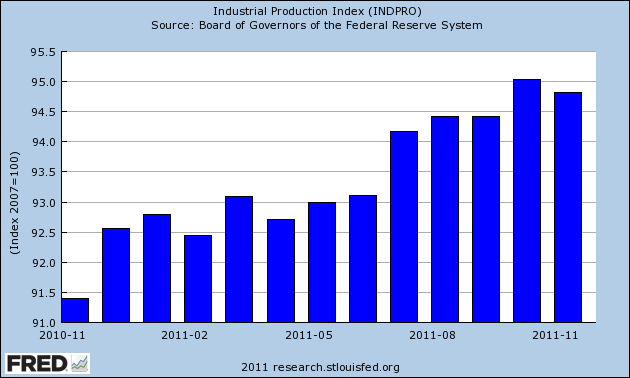 The Federal Reserve Board’s industrial production index for manufacturing (IPMFG) increased 0.5% in October. Regional output in October rose 7.3% from a year earlier, and national output increased 4.5%. • Regional steel sector output decreased 0.4%. Overall, the numbers in this part of the economy dropped in reaction to the Japanese situation, but never contracted into negative territory. In addition, over the last few months, the ISM new orders and production numbers are pointing to possible increases over the first part of next year. 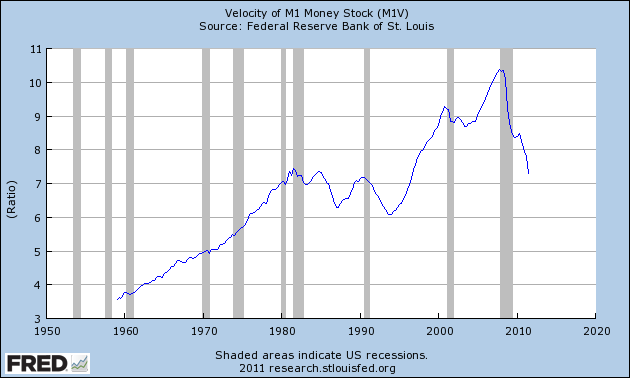 Velocity is the speed at which money flows through the economy. Think of it this way: suppose an economy has 10 people and only 10, $1 bills. Now let's suppose that in year X, each person buys 1 item from somebody else. Compare that to the situation where 1 person purchases 5 things from either the same person or a different combination of people. Either way, the second situation is far healthier because more is going on. 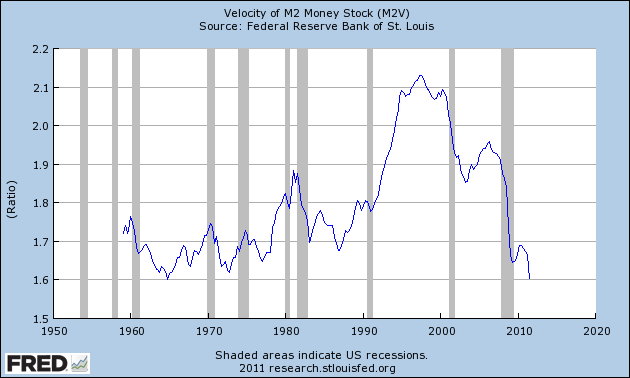 Right now, all the velocity indicators of the various monetary measure are low and declining. That is a very bad situation as it indicates that -- despite the Fed flooding the economy with money -- people are hoarding dollars. 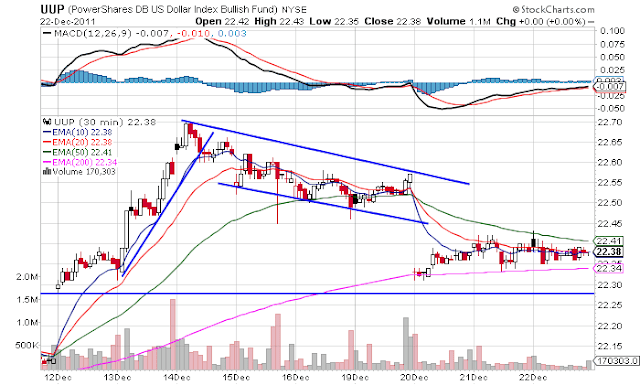 After gapping higher and then rallying, the dollar moved downward in a channel before gapping lower three days ago. However, prices have been moving sideways for the last three days and are still above the lows set from the upward gap. The IEIs are right at technical support. 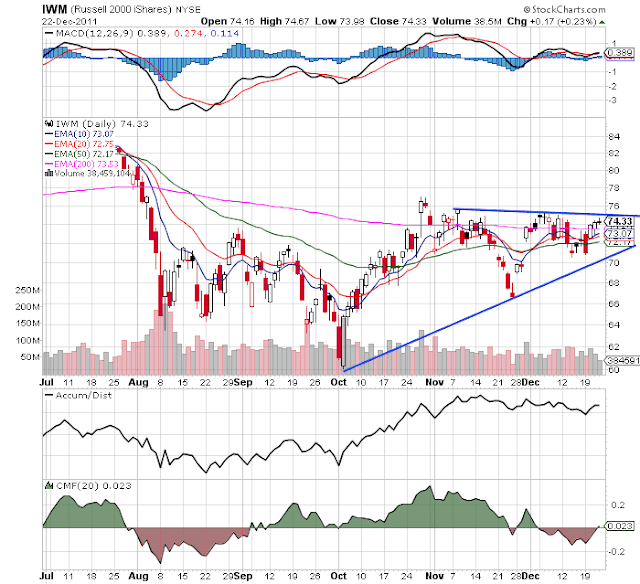 While the chart is still bullish technically (EMA, A/D, CMF and MACD), prices advanced through technical resistance a few weeks ago but couldn't hold onto the rally. This chart bears watching as it could be the first treasury sector to move below important resistance. After falling earlier this year, copper have been consolidating for the last three months in a symmetrical triangle. However, note the A/D line is still at levels seen earlier this year, and the CMF indicates we haven't seen a massive exodus from the market. Also note the MACD is very close to giving a buy signal. The Australian dollar -- which has been consolidating in a symmetrical triangle -- is close to a break-out. Finally, the IWM (the Russell 2000) is still consolidating. Notice that as prices have approached the upside resistance line the candle bodies have gotten smaller. 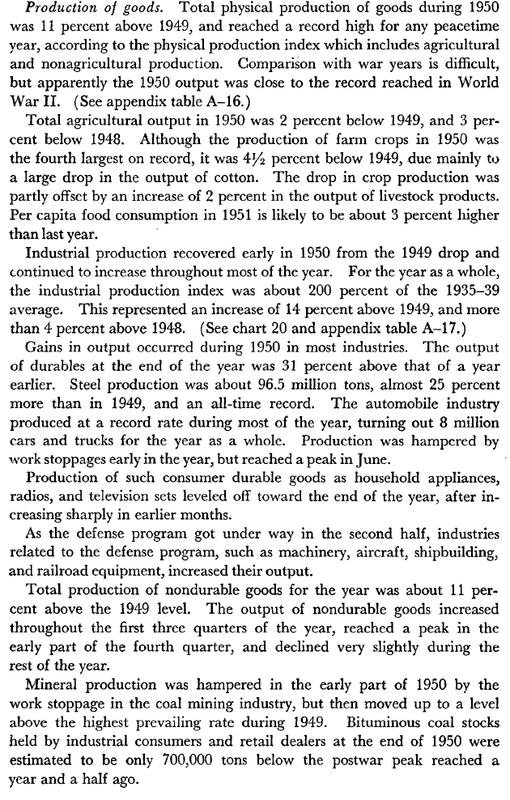 Below are excerpts from the 1951 Economic Report to the President on 1950's production. With this morning's LEI of +.5, the schism continues. At least one of these forecasts is wrong, possibly spectacularly so. The source of the divergence is primarily almost certainly how the two sets of indicators measure bonds. Almost everybody acknowledges that the bond market is an important leading indicator, but in the last 5 years depending on your measure, the nature of that forecast differs markedly. The Conference Board very transparently states that it is the yield curve -- the difference between long term and short term treasuries -- that it measures. In fact, it is one of the two weightiest elements of the LEI. The yield curve has been relentlessly and substantially positive since late 2007, and is the biggest contributor, along with real M2 and the stock market, to the LEI's almost continuous positivity since spring 2009. ECRI, of course, uses a "black box", but we know from at least as late as 1992 that its founder, Prof. Geoffrey Moore, considered bond prices generally to be a "long leading indicator," i.e., a measure of how the economy was likely to perform at least 6 to 12 months later. ECRI's current spokesman, Lakshman Achuthan, has specifically indicated in at least one interview that the yield curve, however, is not one of their measures. But it seems that ECRI goes beyond that and actually does include at least one if not two alternate measures of the bond market in its long leading indicators (USLLI) and/or the WLI: a broad bond index such as the Dow Jones Bond Average or BAA bonds; and credit spreads, i.e., the difference in yields between government and corporate bonds. In fact, as I'll show below it seems all but certain that ECRI does give heavy weight to the latter (credit spreads). The yield curve inverted in early 2006 and remained inverted until spring 2007, accurately forecasting a recession one year later. Since the end of 2007, however, it has been strongly positive. Contrarily, both corporate bonds and credit spreads were flat going into 2007 and began to deteriorate after April, and reached their nadir in approximately November 2008 (probably not incidentally, ECRI is on record that its USLLI and WLI bottomed at this time). The yield curve remains steadfastly positive, although less so than previously, while BAA bonds (and the DJ Corporate Bond Index, not shown) turned down in late 2010 before turning up again earlier this year. Meanwhile, the credit spread peaked in April 2010 and has been deteriorating almost consistently since then. The yield curve remains positive - even though it tracks a similar trajectory to credit spreads. Corporate bond prices as measured by BAA bonds or the DJ Corporate Bond Index have been improving. Only credit spreads continue to deteriorate. They must be one of the important sources of the divergence between ECRI and the LEI. With the near-exception of 1931 as the Fed defended the gold standard, the yield curve never inverted between 1929 and 1954. In other words, bluntly speaking, in times of deflation, a positive yield curve is not terribly predictive. 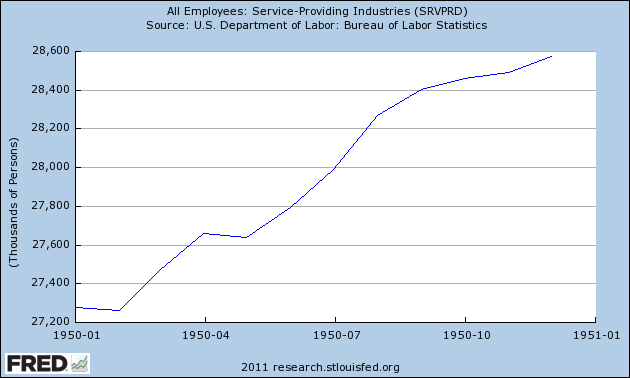 service sector growth increased over 1 million. 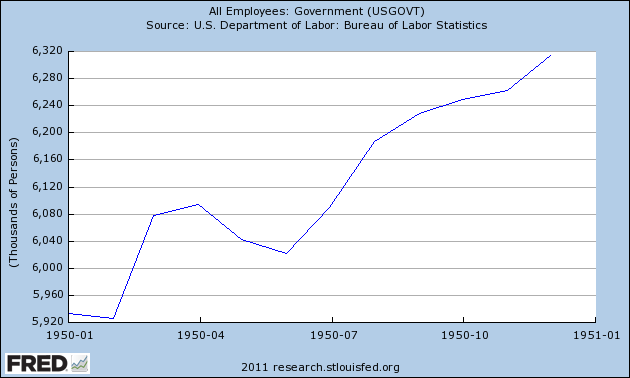 Government employment also increase about about 400,000. 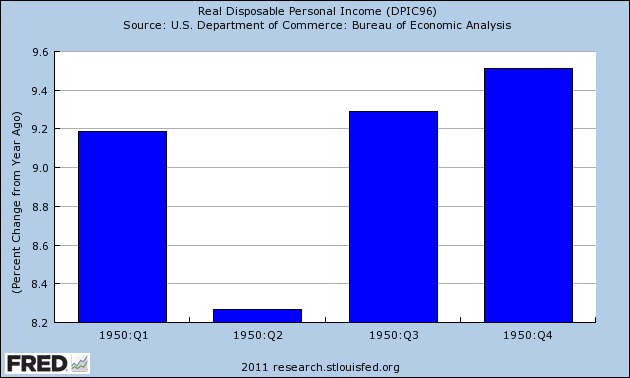 As a result of this activity, we see real disposable personal income increase on a YOY basis of over 9%. 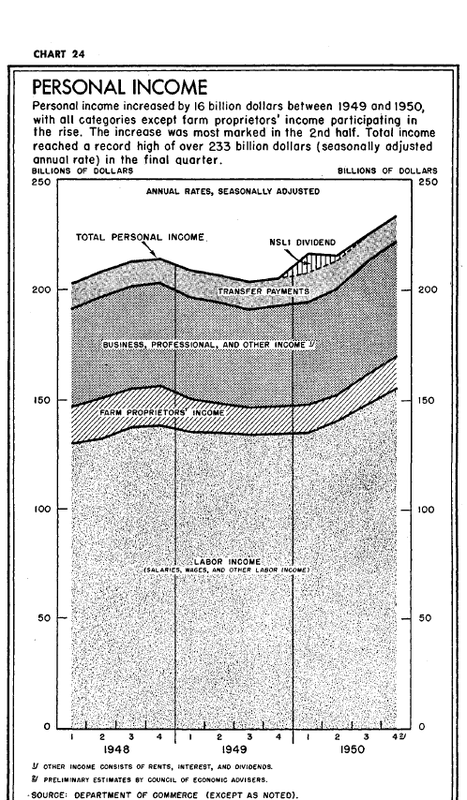 Below are some charts on wages and savings from the 1951 Economic Report to the President that show the above information, but in 1950s econ style. After using Quotetracker for the better part of 10 years, I've made the switch to Stockcharts.com as my source for stock charts. I'm still getting used to the format, but so far I'm really impressed. 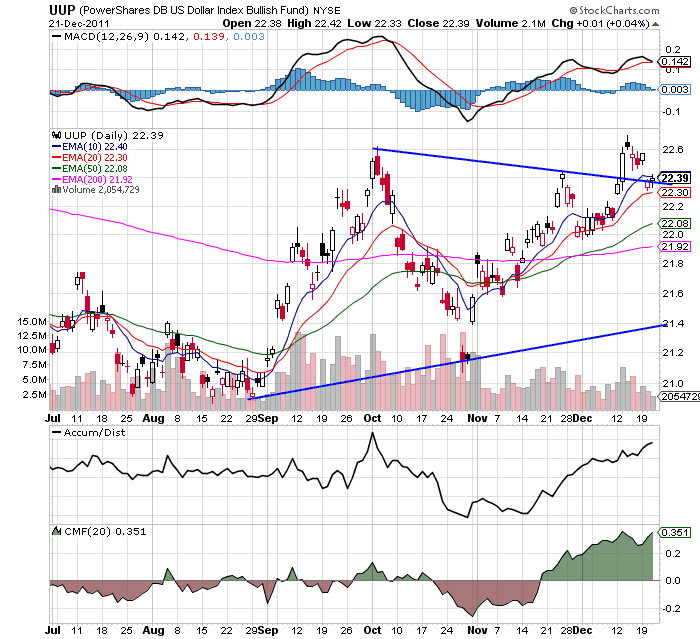 Copper is still at low levels, and is currently trading in slightly downward moving channel. 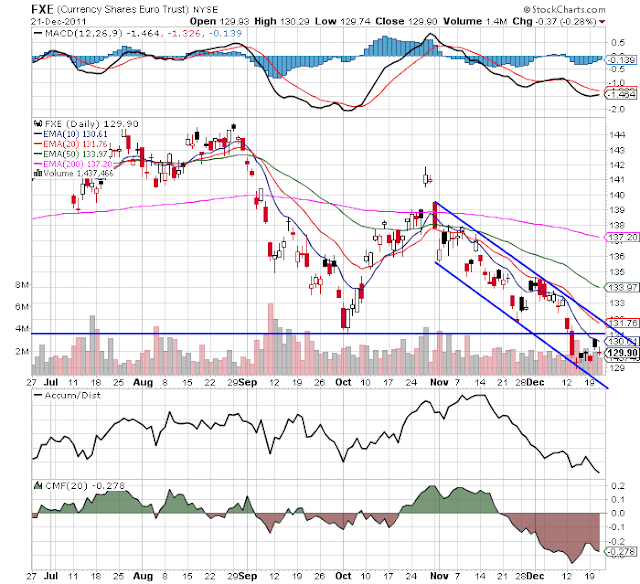 Prices are still below the 200 day EMA, and the MACD is simply moving sideways. The euro is in a downward sloping channel. Also note the massive move from the security in the form of a declining A/D line and CMF. The EMAs are bearishly aligned with all moving lower. For the last five days, we've seen prices print very small bars as they consolidated after the move through early October's low. In contrast to the euro is the dollar, which has clearly benefited from the euro's sell-off. Prices have moved through resistance and are now selling off in small candles as traders consolidate positions. Unlike the euro, note the volume inflow into the dollar. The grains complex (wheat, corn and soy beans) appear to have bounced off a bottom and are looking to hit resistance at the 20 day EMA. 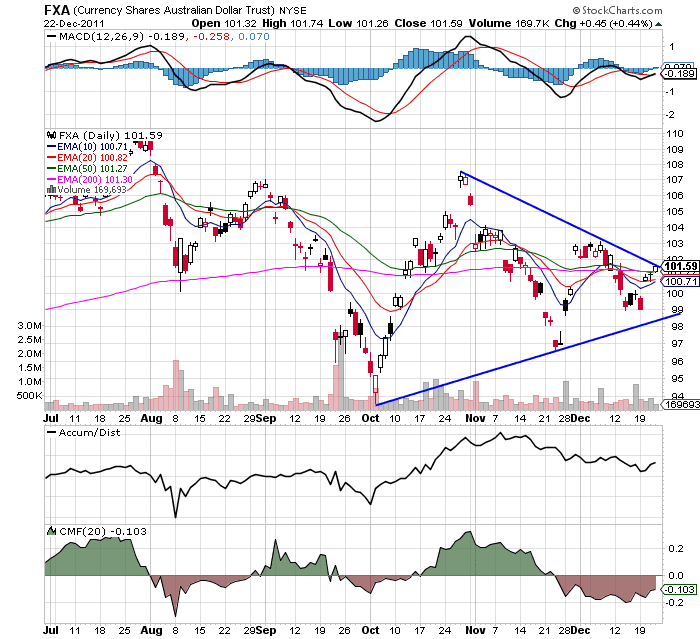 However, the EMA picture is still bearish and the MACD is still in negative territory. If this is a rebound in anticipation of a strong 2012, expect the next resistance level to be the 20 day EMA followed by the 38.2% Fib level. The SPYs are still consolidating, and most likely won't break out in either direction until the new year. 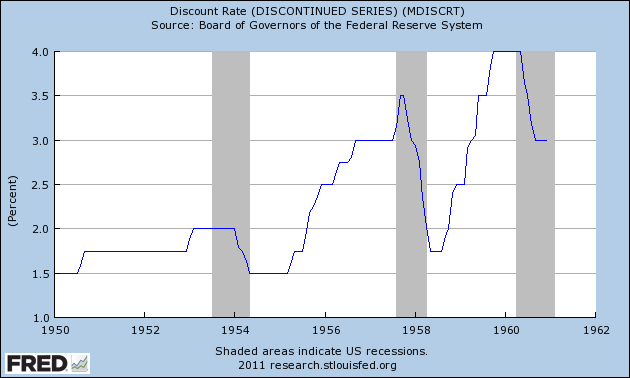 The above chart shows the Federal Reserve's Discount Rate for the 1950s. Note that in the middle and end of the decade we see the Fed increasing rates to such a degree that they create a recession. Then we see the Fed lower rates during the recession to spur growth. 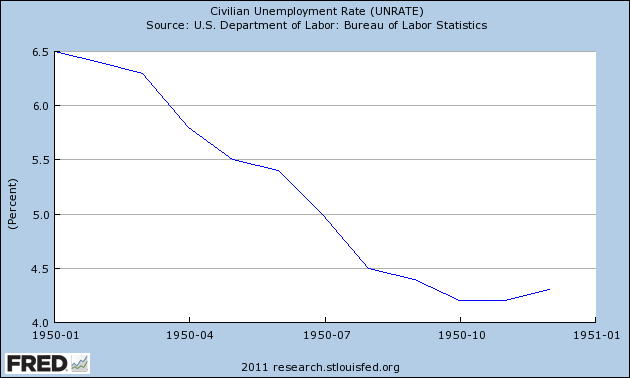 This is what most people think of when they think of "recession and recovery." 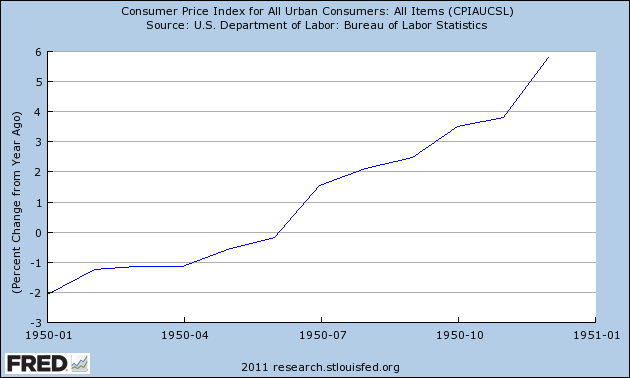 That being said, let's take a look at inflation in the year 1950, as it explains the increase in the discount rate. PPI continued to increase on a YOY rate, eventually reaching nearly 15%, while CPI continued to escalate as well, eventually hitting hear 6%. So -- what caused these price increases? 1.) Massive demand. PCEs increased at incredibly strong rates for the first three quarters of the year. This led to a classic case of demand pull inflation. 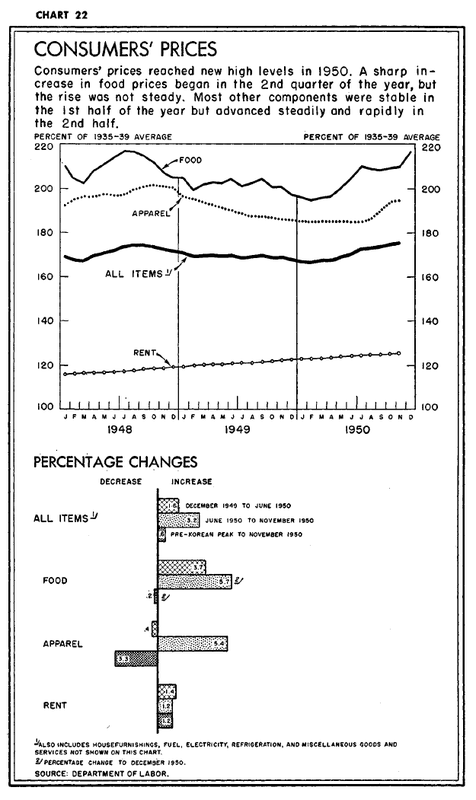 Food prices were a big reason for the increase (which increased 4.8% from December 1949 to November 1950), as was an increase in house hold furnishings (which increased 9.1% from December 1949 to November 1950). 2.) 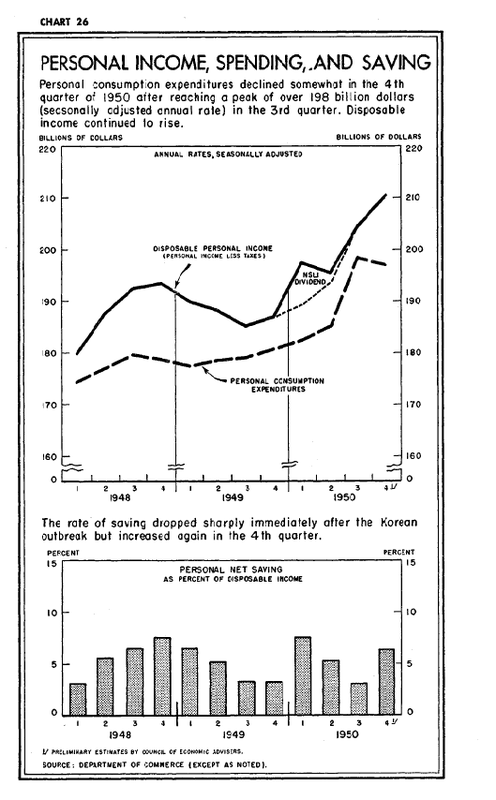 The Korean War outbreak led to massive increases in raw material prices. 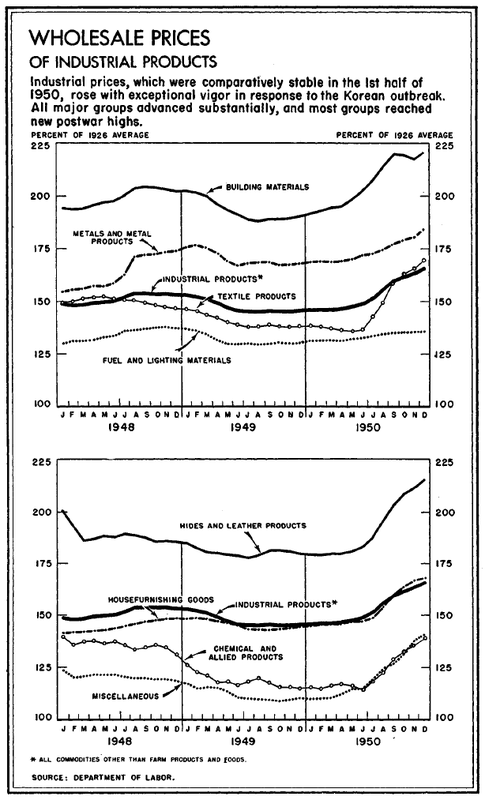 As the ERP notes, 75% of industrial goods had increased in price by mid-October, 44% had risen 10% or more, and 26% were up 20% or more above the pre-Korean war levels. 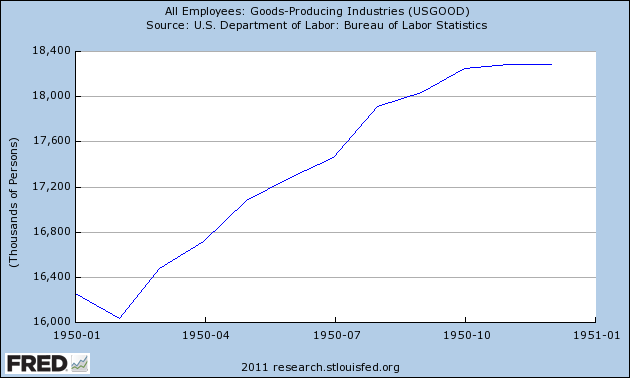 Is Manufacturing Making a Comback? 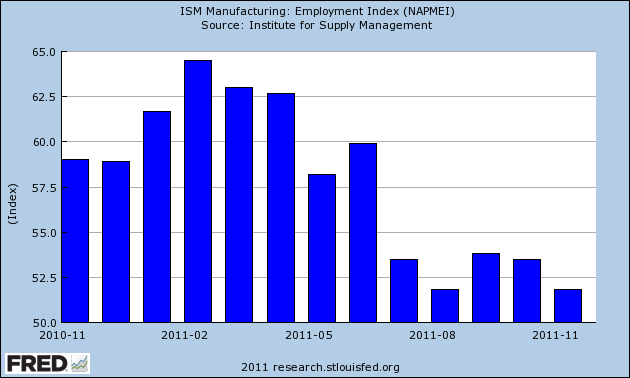 The Empire State Manufacturing Survey indicates that manufacturing activity improved in New York State in December. The general business conditions index rose nine points to 9.5, its highest level since May. The new orders index climbed above zero, to 5.1, and the shipments index advanced eleven points to 20.9. Input price increases steepened, with the prices paid index rising six points to 24.4. Selling prices increased only modestly, with the prices received index inching down to 3.5. Employment indexes were mixed, showing a slight increase in employment levels but a slight decrease in the length of the average workweek. Future indexes rose sharply for a second consecutive month, with the future general business conditions index climbing thirteen points to 52.3, suggesting a return to the high levels of optimism seen earlier in 2011. While the numbers are still low, they are improving. Responses to the Business Outlook Survey this month suggest that regional manufacturing continued to improve in December. All of the broad indicators remained positive and suggest a modest expansion of activity. Increases in input prices were more widespread this month, and there was an uptick in the number of firms reporting increased prices for their own goods. The broadest indicator of future activity reflected a trend of increased optimism about growth over the next six months. The diffusion index of current activity, the survey’s broadest measure of manufacturing conditions, remained positive for the third consecutive month and increased from 3.6 in November to 10.3 (see Chart). The percentage of firms reporting increases in activity (25 percent) exceeded the percentage reporting decreases (15 percent). 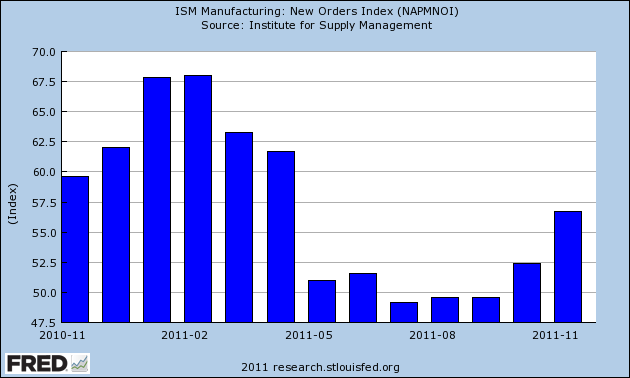 The index for current new orders showed a similar improvement, increasing 8 points. The shipments index, at 6.7, was mostly flat. Twice as many firms reported declines in inventories (30 percent) as reported increases (15 percent) and the current inventory index fell 22 points to -14.9. Labor market conditions continue to show overall improvement, but indexes edged down this month. Twenty percent of the firms reported an increase in employment; 10 percent reported a decrease. The current employment index remained positive at 10.7, only 1 point lower than in November. The average workweek index also remained positive but fell nearly 9 points. Again, the numbers are low, but they did improve. Gold's technical collapse over the last few days has been extraordinary. Prices have moved through key support -- a long-term trend line -- and are now right about the 50 week EMA. 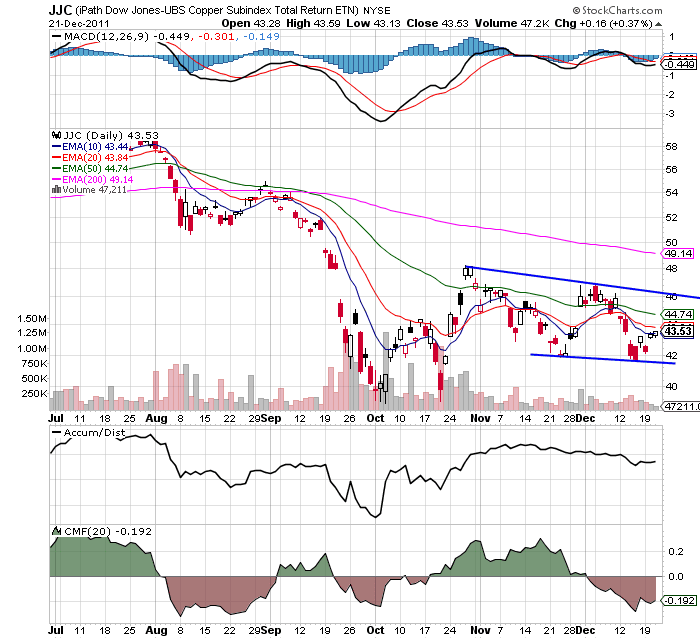 Also note that the MACD has dropped as well, showing a complete lack of momentum. The 6-month chart shows prices have moved through technical support, and have rebounded, hitting resistance at the 200 day EMA. The CMF shows a move out GLD and the MACD shows declining momentum. 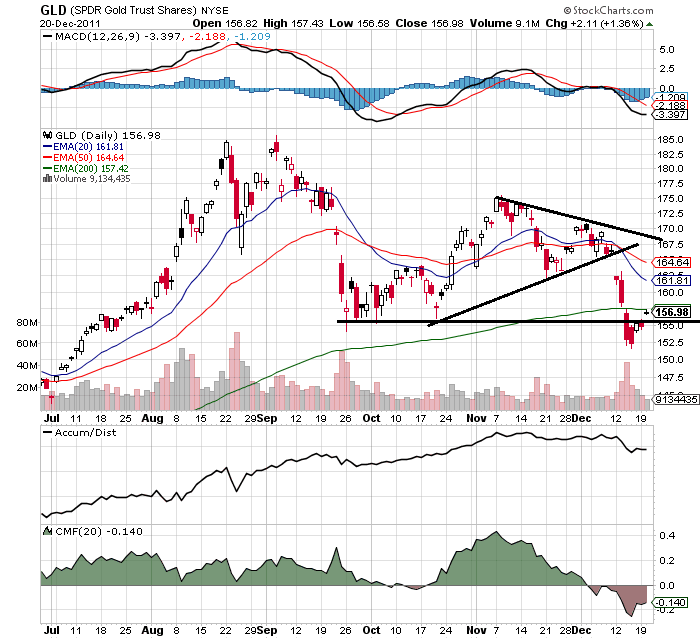 I've boxed off the sharp drop in GLD prices on the 5-minute chart. 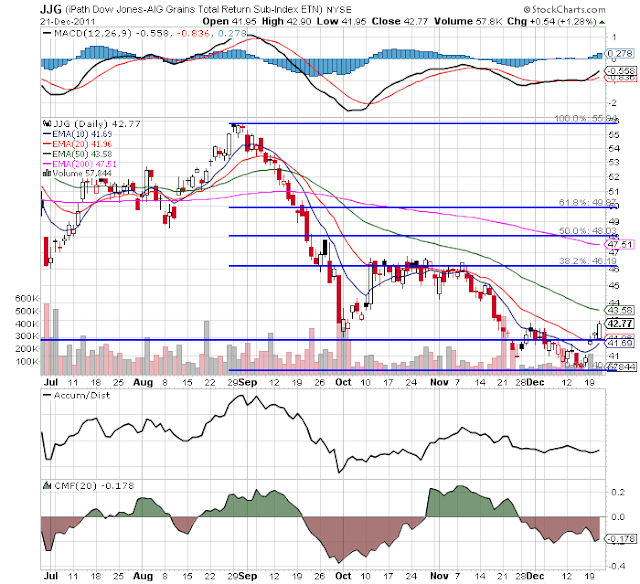 Prices at first gapped lower by a wide margin, consolidated sideways, and then continued to move lower. For the last three days, prices have moved a bit higher, but not in a strong rally; instead, prices have simply gapped a bit higher and then held on. Year In Review: Where Did Growth Come From? 1.) PCEs continued to contribute fairly consistently all four quarters. 2.) Investment was a bit lackluster; it contributed some, but not in as a large a way as we would like. 3.) Exports played a very important role; while they were not the primary driver of growth, they contributed in three out of four quarters. 4.) Government spending (or the self-imposed austerity) actually contracted from growth. Note the strong contributions of durable goods for the first two quarters. My guess is the first quarters pulled some growth forward from the third quarter -- which was also negatively impacted by the debt ceiling debacle. Service spending greatly accelerated in the third and fourth quarter. 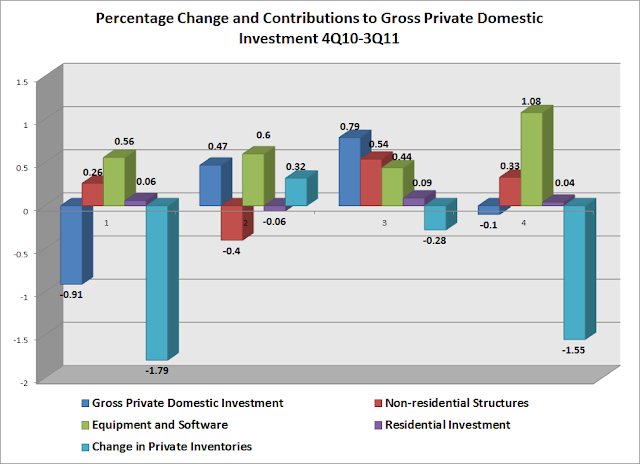 First note that investment in equipment and software was strong throughout the last four quarter period. If businesses are scared to invest because of massive regulation, it sure doesn't show in the numbers. In two quarters massive contractions in inventories greatly effected the overall number. Note that residential investment is non-existent. In a solid recovery, we'd be seeing a heck of a lot more investment in this area. Finally, non-residential structures contributed in three out of four quarters. 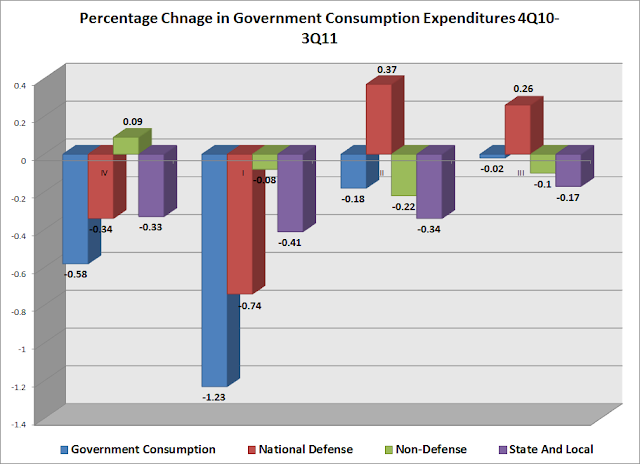 Finally, note that government spending took away from growth, with a big bite coming from national defense contractions and state and local cutbacks. 1.) Consumer spending is still increasing, although not as strongly as we would like. 2.) Lack of residential investment is really hurting the overall numbers. 3.) Business is still investing in a variety of equipment and software. 4.) The contraction in state and local budgets is also hurting overall growth as well. 5.) 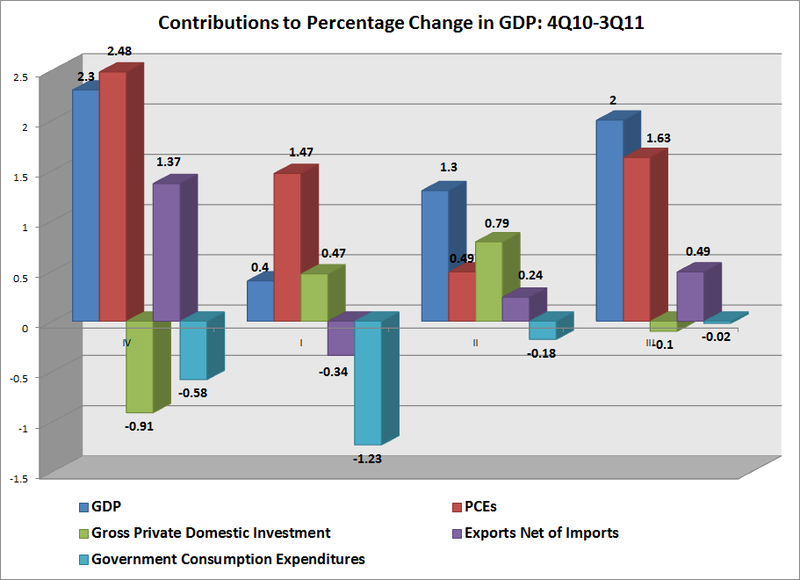 Exports are also playing a pretty important role in the expansion to date. A month ago when housing starts and permits were reported, I wrote: Psst: Is this the beginning of the end of the housing bust? With this morning's report of 681,000 permits issued, I believe we can affirmatively answer, YES. As I said last month, housing construction is a long leading indicator, indeed along with interest rates probably the most important one. So those commentators who say that we won't get housing improvement until we have job improvement have causation exactly backwards. Rather, it is much more likely that we won't get more meaningful job improvement until we have more meaningful housing improvement. Further, the decline in housing starts and permits after the expiration of the $8000 housing credit was probably an important factor in the slowdown in GDP earlier this year, and as I wrote last week, probably plays a role in ECRI's recession call. With November's report we are 85% of the way there from the March 2009 bottom of 513,000. Additionally, per Bill McBride a/k/a Calculated Risk, there is a strong leading relationship between housing starts and the unemployment rate, so a confirmed uptrend should mean a reduction in the unemployment rate. While by no means are we at the end of the housing bust, today's number serves as confirmation that we are at least at the beginning of the end.